stylos: Where does the name "Jehovah" come from? Image: The tetragrammaton, the four consonant Hebrew term for God: Y-H-W-H. 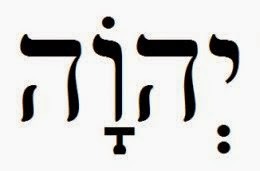 Image: The Hebrew word "Adonai" with vowel points. Image: The tetragrammaton with the vowel pointing for "Adonai" which apparently resulted in the transliterated English term "Jehovah" in early English Bible translations like the Geneva Bible and the KJV. The English word “Jehovah” appears four times independently in the KJV of the Old Testament (Exod 6:3; Ps 83:18; Isa 12:2; 26:4). It also appears three other times as a compound: Jehovahjireh (Gen 22:14; the LORD will provide); Jehovahnissi (Exod 17:15; The LORD is my banner); and Jehovahshalom (Judges 6:24; The LORD is peace). Side Note: The word “Jehovah” also appears in the Geneva Bible at Exod 6:3; Ps. 83:18 (but not at Isa 12:2; 26:4) and as a compound at Gen 22:14; Exod 17:15; and Judges 6:24 [and perhaps in other places in the Geneva Bible; I have not surveyed the entire]. I have also not yet taken time to survey whether it appears in other early English Bible translations which predate the KJV, like the Great Bible (1540) or the Bishop’s Bible (1568), but this seems likely. The evidence from the Geneva Bible alone proves that “Jehovah” is not a unique rendering of the KJV. In each instance “Jehovah” is a transcription/translation of the tetragrammaton or four consonant special name for God that frequently appears in the Old Testament. This divine name is usually translated in the King James Version simply as “LORD” (“Lord” in all capital letters). This is a very helpful convention in that it informs the reader who does not know Hebrew when the tetragrammaton is being used. It is in keeping with the translation philosophy of the King James Version to use a variety of English words to render the same underlying original language term (see “The Translators to the Reader” in the Preface to the 1611 KJV which explains, “we have not tied ourselves to a uniformity of phrasing, or to an identity of words”). The ancient Hebrews had an aversion to pronouncing the name of God and instead used the word adonai (“Lord”). The term “Jehovah” apparently comes from the Hebrew consonants of the tetragrammaton (J-H-V-H), along with the vowel markings for adonai. Some modern translations render the divine name as “Yahweh,” from the consonants from the tetragrammaton (Y-H-W-H) [preferring, however, to use J for Y and V for W]. The term “Jehovah” has also come to be distinctively stressed by the Jehovah’s Witnesses religion, a modern heterodox offshoot of Christianity. The Jehovah’s Witness’ New World Translation (Revised in 2013) selectively translates the Greek word kurios (“Lord”) as “Jehovah” in various NT passages to fit their idiosyncratic beliefs, including the denial of the divinity of Jesus (e.g., When Jesus is referred to as kurios by Thomas in John 20:28 the word is not translated as "Jehovah" but as "Lord"). In the King James Version and other orthodox translations the English word “Jehovah” is never used in the New Testament, since it is a unique transliteration of the Hebrew name for God and the New Testament is written in Greek. The hybrid word “Jehovah” is a combination of the vowels of “Adonai” with the consonants of the tetragrammaton….” (p. 1036). An artificial form, often attributed to Petrus Galatinus in ca. A. D. 1520, which results from the combination of the consonants of the Tetragrammaton, “YHWH,” with the substitute vowel reading which was introduced when the MT was fixed during the sixth-seventh centuries A. D. The pre-Masoretic text was consonantal, vowels being supplied by the reader from a knowledge of the language. In the post-exilic period (after 538 B. C.) the sacred name “Yahweh” was withdrawn from popular usage for fear it would be profaned. Of the various substitutes that were employed, the chief was “Adonai” (“Lord”), the vowels of which the Masoretes as a rule added to the consonants “YHWH” to indicate that “Adonai” should be read. The combination of the two—the Tetragrammaton and the vowels of “Adonai”—yields the artificial name which appeared in a few passages of the KJV and was regularly used in the ASV. The RSV, following ancient synagogue practice, renders, “The Lord” (p. 817). Many scholars from the reformation and post reformation believed that the correct pronunciation of the sacred name was "Jehovah", and there are some that still uphold this position, like the karaite Jew Nehemia Gordon (http://www.karaite-korner.org/yhwh_2.pdf). It is a interesting debate, but besides the pronunciation, I think it is the meaning and the understanding of the Sacred Name of our Lord is more important. Thanks for the comment and the link to the article. Very interesting. I have to say that my antenna rises with almost anything that is a modern "scholarly" consensus. This is a good reminder that the "Adonai" vowel markings for the tetragrammaton is a theory, and it may be wrong. I did not read the Gordon article very closely but was struck by what I read of his observations on lack of qere-ketiv evidence for the "Adonai" vowel pronunciation. I think it is highly likely that the denigration of "Jehovah" was part of the 19th-20th century war on the KJV (and the handling of its underlying traditional text). One part of the "Harper's Bible Dictionary" which I did not quote was this line: The word Jehovah's "appearance in the KJV was the result of the translators' ignorance of the Hebrew language and customs." Perhaps they were not as "ignorant" as the author of this entry believes. It is interesting that he picks on the KJV, in particular, though, as I note, the use of "Jehovah" was also in the Geneva Bible and probably others. Maybe they weren't as "ignorant" as some modern scholars might think. I wonder also how this is connected to the debate about the antiquity and transmission of the vowel points by Owen (vol. 16) and others. Anyhow, thanks for the helpful comment. I would assume this was Gill's view. It certainly was Owen's, as expressed in his article "A Vindication of the Purity and Integrity of the Hebrew and Greek Texts of the Old and New Testament" (in his Collected Works, Vol. 16). The antiquity of the vowel points was apparently challenged by the Jewish scholar Elias Levita in his book "Masoret ha-masoret" (1538). Catholics seized on this to argue against sola scriptura (i.e., mother church must tell you how to properly vocalize and interpret the OT). The antiquity of the points were defended by Johannes Buxtorf the elder, but in 1624 Louis Cappel, a Protestant, supposedly offered a "devastating refutation" of Buxtorf in his "Mystery of the Points Revealed" (English title for the Latin original). From then on, it seems, the scholarly consensus has been that the Hebrew vowel points were a later invention of the Masoretes. As noted, the "scholarly consensus" is often wrong or based second hand on the authority of "leading scholars" without firsthand examination. I'm continuing to look at it.